Egyptian security forces have killed 27 "very dangerous" terrorists during recent security operations, the Armed Forces said in a statement on Wednesday. 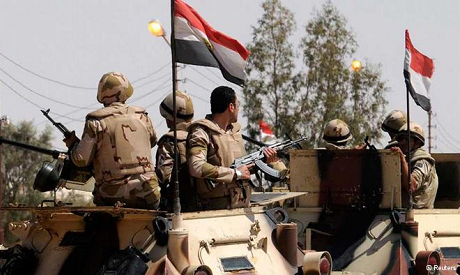 The army said that 24 terrorists were killed in a shootout during raids in Sinai and Suez Canal cities, and that the terrorists were in possession of weapons and ammunition. Air forces killed three others in the country's Western Desert bordering Libya, it added. The statement said the terrorists were killed over the "past period," without giving a specific timeframe. One soldier was killed in a shootout with militants, it added. The statement also said that airstrikes destroyed 61 vehicles containing weapons and ammunition in the Western Desert. Security forces discovered and destroyed 344 bombs planted to target forces, as well as 342 hideouts and weapons depots used by terrorists in central and northern Sinai. Over 400 suspects have also been arrested. Border guards arrested around 3,000 people of different nationalities trying to cross the Egyptian borders and seized large amounts of illegal narcotics. The military launched in February a large-scale operation to eradicate terrorists who have regularly launched attacks that have killed hundreds of security forces over the past few years. The months-long campaign involves the army, navy, air force and police.